Sebastian Vettel has defended Ferrari's strategy during the Singapore Grand Prix as he fell further behind F1 title rival Lewis Hamilton. 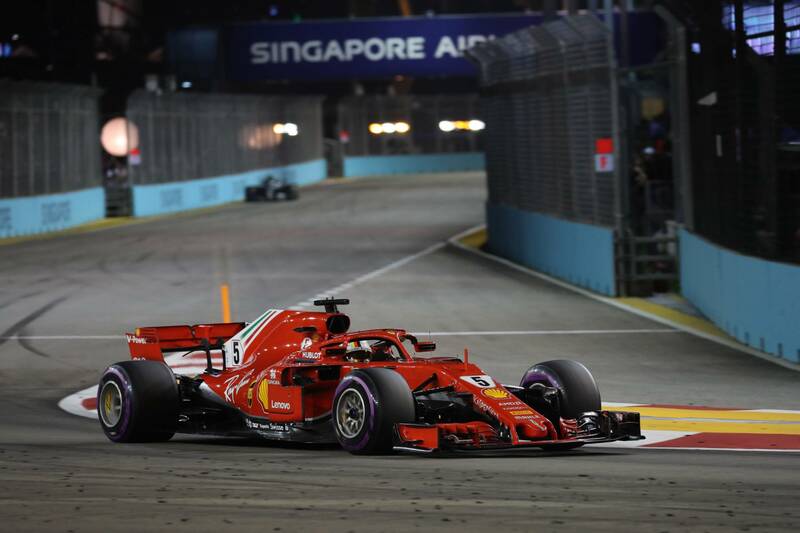 Sebastian Vettel has moved to defend Ferrari’s strategy calls as his Formula 1 title aspirations took another hit during the Singapore Grand Prix. Ferrari had been tipped as the pre-race favourites heading to Singapore with Mercedes expecting to struggle, but Lewis Hamilton converted a surprise pole position into an important victory to extend his championship lead over Vettel to 40 points. Vettel could only qualify third, and despite initially getting ahead of Red Bull’s Max Verstappen on the opening lap, Ferrari’s gamble to try and undercut race-leader Hamilton backfired as Vettel lost out to Verstappen following the pit stop window and ultimately had to settle for third. “I think it’s pretty obvious what we tried to do and it didn’t work and we got ourselves in trouble with the car that I had to pass on track,” Vettel explained. “It was not easy and we lost too much time. Red Bull did very well to react and jump us. The German fully backed his team’s strategy call and said he would rather Ferrari be aggressive in pursuit of victory, rather than simply settling for second place, despite losing further ground to Hamilton as a direct result. “I will always defend the team,” he added. “I think the decisions we took in the race, the decision to try and be aggressive, if it works it’s great and today it didn’t work and it didn’t work by quite a bit, so we need to look into that. “But I believe we saw something and we went for it. Inside the car it’s difficult to be on top of everything because you don’t see the whole picture. “We’re not playing silly games and the level of the competition is very high, so if you make the slightest mistake there are other people to benefit from it, as Max did today. Vettel ultimately conceded Ferrari was just not quick enough to challenge Mercedes for victory when it mattered. “It’s not the result we wanted and it is a disappointment because we came here thinking that we are strong, and I think we were, but not strong enough or as strong as we wanted to be in terms of raw race pace. “You see with the gap in the end that it’s clear we weren’t quick enough today, so we need to understand why and it’s largely to do with how we decided to race and which tyres and for how many laps etc.